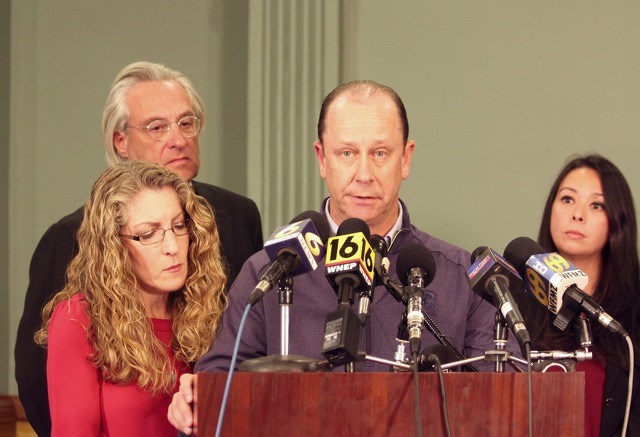 As District Attorney Stacy Parks Miller on Monday announced new charges against former Beta Theta Pi fraternity brothers in connection with the February death of pledge Timothy Piazza, she was joined by Piazza's parents. Jim and Evelyn Piazza appeared at Parks Miller's side back in May, when the initial charges in the case were first announced, and they were there in courtroom 1 of the Centre County Courthouse throughout the summer during a preliminary that stretched out over months for 18 fraternity brothers and the fraternity chapter. New charges were brought on Monday against 12 defendants who previously had not been charged, and additional counts were brought against five who already were facing charges. That was the result of the recovery of surveillance video from the basement of the fraternity house -- footage police said they discovered was deleted after fraternity members initially told them the cameras there weren't working. Video from the first floor of the house was used extensively in bringing the initial charges, but the basement is where the majority of the drinking occurred the night of Feb. 2 and early morning of Feb. 3, according to court documents and testimony. The new charges in the case bring the total number of defendants to 26 individuals and the fraternity chapter. A total of 13 individuals face the most serious charges of aggravated assault and involuntary manslaughter. The newly recovered footage allegedly revealed who specifically provided alcohol to 19-year-old Tim Piazza in the basement during a fraternity initiation ritual and then during a party that followed. Before Piazza suffered the his first fall the night of Feb. 2, the prosecution says he was provided with at least 18 alcoholic drinks in the period of 82 minutes. "Guess what guys? Now we know." Piazza, his voice cracking at times throughout two minutes of prepared remarks, said it was "a joke" that the brothers didn't know they were putting Piazza, and other pledges, at risk by giving them enormous quantities of alcohol over a short period of time. "They then left him to die alone and tried to cover it up," he said. He called on those allegedly involved to take responsibility. "It’s time to man up fellas and be held accountable for your actions," Piazza said. "We are making holiday plans without our son, Tim, because of your actions. If you did not commit the acts you did, we would not be here today and we would anxiously be awaiting Tim’s return home for Thanksgiving break on Friday. Instead we are asking how do we make sense of the obvious void at our Thanksgiving table." Piazza also called on Penn State to take stronger action to curb hazing and other issues with the fraternity system. "Hazing needs to stop. There is just no place for it. A statement needs to be made," he said. "Universities throughout the country are starting to take a much tougher stance against hazing and the hazers and we applaud them for it. The leadership at Penn State needs to take a tougher stance and should start by following through on their own proposals. However, I remain concerned." Penn State has implemented a number of reform measures for Greek life since Piazza's death, though the Piazzas and their attorney Tom Kline have been critical of their effectiveness. “Our hearts continue to break for the anguish being experienced by the Piazza family, as this shocking and sad story continues to unfold. Student safety is our priority, and we will continue to hold accountable those who are found to have put the well-being of others in jeopardy. Penn State released a statement in response to Centre County District Attorney Stacy Parks Miller’s announcement on Monday of new charges against former members of Beta Theta Pi fraternity in connection with the death of Timothy Piazza.